I had sent you my MRI disc back in January, and you confirmed what I had suspected for a while, that I indeed had a plantar fascia tear. I have to admit, I have not exactly followed your advice to the word. I did wear the boot, but only for 2 months...as it turns out, my dog had to have her third surgery in 7 months on her leg, and it was extremely difficult to help her with the boot on (she's a large dog, 70 lbs, and it required walking next to her on leash at all times, lifting her, etc.). I gradually weaned out of the boot over a few weeks. Things are not going as well as I had hoped. My foot still bothers me on a consistent basis, which I don't understand, because up until last week I hadn't even *tried* anything that should irritate it. Dr. Blake's comment: Were you able to attain the 0-2 pain level in the boot? You have to be in the boot for at least several months at that low pain level. If not, either go back into the boot or try the mountain bike shoes. Your orthotic devices should shift the weight into the arch and feel protected and soft under the heel. One night last week I was sitting on my couch, and I thought you know what? I'm just going to give a quick run a shot. It was probably about .35 mile. I knew not to try anything crazy. I have attempted the same a few times since then, and it feels like I'm back to square one again. It doesn't necessarily bother me during the run, but afterward. My foot is still sore in the mornings (but that never really went away anyway), but it's not like PF pain...it's kind of just diffuse soreness that is more noticeable around the PF attachment to the heel...I'm wondering if this morning soreness something I'm going to have for the rest of my life? It also doesn't take as long to go away as it did at its peak. Dr. Blake's comment: We use our general rules on time, but one person can be different than the next, unfortunately. You need to be so much better day after day before you can run. Your symptoms can mean that things are healed, but not strong. Day to day has to be good first with the boot or shoe before you can wean from the boot or shoe. Then you need to build up your walking so that you are at a minimum of 2 weeks, no pain, walking at least 30 minutes at a nice clip before you start a walk run. You probably should be wearing the boot or shoe during the day to rest the tissue, use the support the foot taping 5-6 days at a time, continue icing and try some contrast bathing to see how you feel. 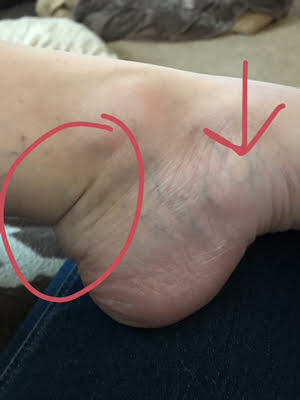 I also noticed that, while the middle of my heel isn't sore to poke like it used to be, there is a spot that still hurts to touch, and I'm not sure why? (The spot I am pointing to in the photo.) Sneakers really seem to bother me in that spot, I have found only the crocs I use for the yard are comfortable. I have started to wonder if there is not something going on in conjunction with the tear...a nerve issue maybe? Dr. Blake's comment: That could be a possibility. You are pointing right to the plantar fascial attachment so that does not like unusual. You could have a plantar heel bursa. Those can be painful. Try to use the frozen sports bottle roll over the sore bottom, but do not roll into the plantar fascia tear. Only the direct bottom of your heel for 5 minutes twice daily. I also noticed after every attempt at a short run, my calf gets really, really tight. I try rolling and using the stick and it doesn't seem to help at all. I know I didn't follow the protocol exactly, but I have been pretty careful, and I just feel so discouraged about the level of discomfort I still experience on a daily basis. Dr. Blake's comment: With plantar fascial tears, in the immobilization phase, I allow no stretching of the calf or fascia. The two weeks you are out of the boot, and feeling good, I allow patients to begin to stretch the calf, but still no the fascia. This can give symptoms of tightness, so do not be too discouraged. The next 2 months boot or shoe, ice twice daily, tape daily, stretch the calf as long as the heel is firmly on the ground three times a day. You can get PT so long as there is no stretch of the arch. It is really wearing me down, I just want to feel like I have my life back again. I'm also having a heck of a time trying to find a doctor out my way, and I was wondering if you might be able to offer any advice in that regard? (I have seen 4 podiatrists in person, none of whom helped me at all, which is why I ended up finding you.) As always, thank you so much for reading and for your help! Dr. Blake's comment: Check the members for the AAPSM (sports podiatrists) in your area!! Typically we can find someone. It is not certain that you say you are a sports podiatrist and practice a conservative meaningful approach. So sorry to bug you with another e-mail. I am really struggling with what kind of doctor to see. Two of the podiatrists I have seen previously were members of the American Academy of Podiatric Sports Medicine...and unfortunately, their advice was less than helpful. I thought I would make an appointment with a local foot and ankle orthopedic specialist...except the receptionist (pretty rudely) informed me he will only take on surgical cases. So, I made an appointment with their podiatrist instead, but upon finding this out my PCP told me it would essentially be a waste of time and that this particular doctor would probably prescribe a pair of orthotics and send me on my way. Should I be looking for a podiatrist, a sports medicine doctor who doesn't necessarily specialize in feet, or an orthopedic foot and ankle doctor? Dr. Blake's comment: I am sorry. I do feel podiatry is the way to go for this. I would call the office of Dr. Stephen Pribut near DC. He is wonderful. Tell Dr. Pribut that I am asking you to see him or recommend someone close to you. My son played basketball in Wayne at Cabrini College so I know that is quite a distance. He may have the exact person for you to see. Are you in good orthotics? What shoes are you wearing? What are your running mechanics like? These are all questions we need answers to help you. Temple University has a podiatry school that may help. There used to be a Dr. Howard Palamarchuk, but I am not sure if he still practices. Do you know anyone in the relative Philly area you could recommend? I am having such a hard time, and I have spent so much already on this issue, my resources are pretty limited...so I can't afford to pick the wrong place again. 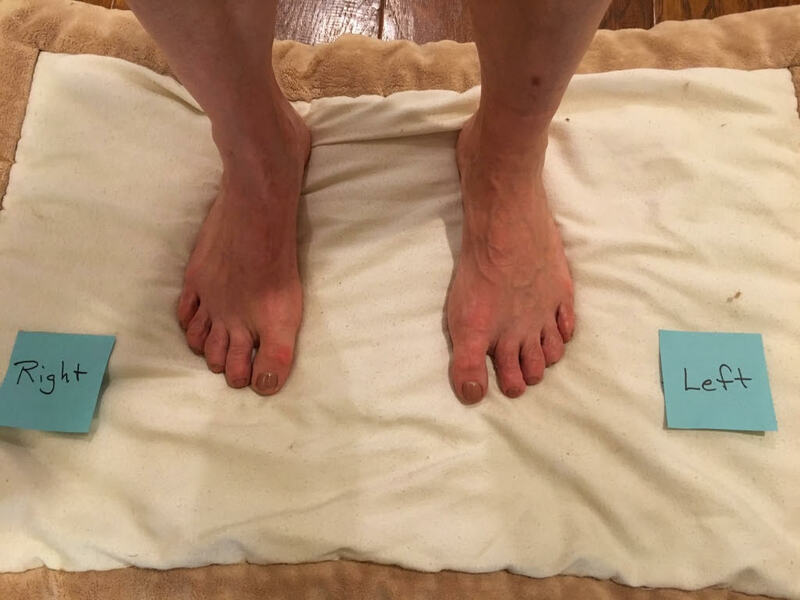 I also noticed that along with tenderness at that point in the photo from my previous e-mail, my foot is a bit swollen around the back of the ankle and the inner arch...not sure how much concern this warrants? Dr. Blake's comment: These are areas that fluid from any cause can collect in. Probably not a big deal. As always thank you so much for your help! Please take your time! Thank you so much for getting back to me. I somehow managed to forget to mention this...sometimes I will get a stabbing pain in that sore spot in the first photo, it comes in bursts of about 10-30 seconds, it is quick but SO painful. Feels like someone repeatedly stabbing a knife in that spot...and it happens randomly, sometimes even when I’m just sitting at my desk(??? )...it happened yesterday after I finished mowing the yard, and I held my foot up thinking if I put it down the pain would be unbearable...to my shock it really didn’t make a difference. I’m not sure if this is a clue to what’s going on??? Dr. Blake's comment: When you tear the fascia, we want scar tissue to get in there and heal the injury. The scar tissue can get bound up in the local nerves giving you these symptoms. These should improve as you begin to stretch the fascia, but that is probably 3-4 months away. Good luck my friend. I am attaching for the readers my Plantar Fascial Protocol we give patients in the office. The following is the patient's response to my questions and comments. Is something like a Hoka One One an acceptable alternative? (I have an old pair I can try before buying new to see if they seem to help at all.) Dr. Blake's comment: Not as good, but you can alternate back and forth for the next 4-6 months. Yes, after the first week my foot adjusted to the boot and it really wasn't painful wearing it at all, which is also one of the reasons I felt it wouldn't be too terrible to wean out of it at 2 months when I needed to help my pup! Dr. Blake's comment: Your beautiful dog's photo did not transfer over. The boot did its job, but what you went into after was inadequate to continue the immobilization. It also could have been the orthotics, not taping, doing too much with the new found freedom. I can't even walk my other golden without pain, so I should have known better than to attempt a run, but I was having a "good" day so I thought I'd test the waters, and also I'll admit I was getting impatient. Dr. Blake's comment: In my world, we need to talk in terms of a consistently good week, over a run of good days, before attempting the next level of activity. That would have been a walk-run program as outlined in my blog. If it's an inflamed bursa, is it safe at this point to get an injection? Or should I avoid them indefinitely in that foot since it has a history of a tear and that would only further compromise the integrity of the plantar fascia? Before I used to have pain directly in the center of the heel (red circle), now it seems to emanate out from the sore spot into the side of the arch (yellow) and the actual heel has little to no pain...but I should be icing where the circle is? Dr. Blake's comment: Yes, that is where you ice. The bursae are under the heel. Are you having any pain there? Does not sound like a good idea to inject. Yes, I fear the plantar re-tearing some. I have KT Tape, is that ok to use? Dr. Blake's comment: yes, there are many ways to tape with good results. Start with KT to see how it works for you. Before I received your reply I made an appointment with another podiatrist who is also a runner for next week. If that doesn't work out, I will definitely call Dr. Pribut, thank you!!! This patient broke her toe and developed severe nerve pain afterwards. This post is also included on her original post of 4/5/18. This is a wonderful example of how active we have to be in our treatment to get the right healing plan working. I have just spoken with your nurse/receptionist and she suggested I describe my foot concern to you. I had sesamoid surgery on both my feet twenty-five years ago in Pasadena California. Up until last summer, my feet were handling my everyday wear and exercise just fine. One of the surgeons gave me a shot of prednisone in the big toe of my bad foot. This did help with my nerve pain and foot discomfort. In caring for my foot I bought wide enough shoes to fully support the expanded width of my left foot and my disfigurement. I am athletic and always have been. Since my foot alteration, I am walking with orthotics. One week ago, I was trying to make an appointment and was required to walk for at least 35 minutes in a sandal which has good support for both my arch and bunion area. Well, I thought. I am normally paranoid to wear only a few pairs of shoes that work with my condition. The result was concerning. My foot feels that it has become disfigured even more. I have been compensating for the past year, to not put full weight on my left foot. Currently, I am having knee pain in my right knee. I transfer my weight constantly. I have taken a bad fall heading up the stairs because of my foot alteration. Every step I take is now is a concern to me. My question is are you a surgeon and do you know how to repair a condition like mine? If not, do you know a surgeon who can which you recommend? Thanks for the email. It sounds like Hallux Varus where the big toe moves away from the 2nd toe. If that is the case, surgical correction is necessary to realign the joint. Care has to be taken not to make the joint too tight, causing a limitus condition, and thus causing more of a problem. 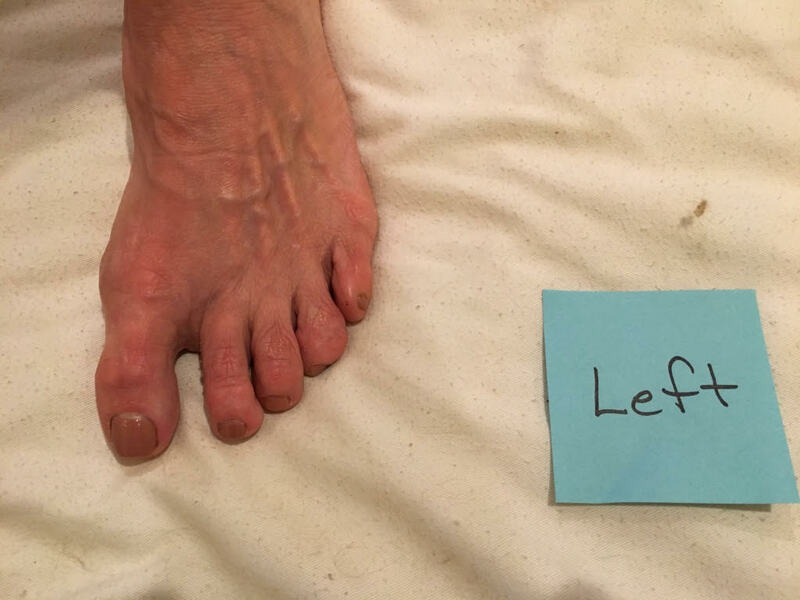 Send me a photo of your foot for this post to make sure we are talking about the same thing. Also tell me what sesamoid was removed many years ago. It makes sense that the fibular or lateral sesamoid was removed making it easier for this to occur. Your treatment plan for the fractured sesamoid in my left foot is going well, especially since I got Dr. Jill's 1/4" felt met pads, which work better with your orthotics than the 1/8" felt I was using for months. I've been able to increase my weekly walking distance gradually to about half what it was before the injury, but last week I suddenly developed a new problem in the right heel which has immobilized me again. Dr. Blake's comment: Thank you for that feedback. I will try to tell all my sesamoid patients to experiment with the Dr. Jills product, even with their orthotics. So happy you are off the long plateau you were on. Before starting a hike, I was doing a standing hamstring stretch with leg elevated onto the tailgate of my truck (I had already done my other stretches, including the "wall" stretch for calves). Toward the end of the stretch, I flexed my toes back toward my knee, and when I set my foot back on the ground (wearing heavy hiking boots and orthotics as always), I felt a sudden sharp pain in my heel. Dr. Blake's comment: This is nerve irritation at the end of the sciatic nerve branch that feeds the bottom of the heel. The sciatic nerve is most stretched, and potentially irritated, with the hip flexed, the knee straight, and the ankle bent. Maximum stretch. It only takes slightly bending the knees or not pulling up the foot towards your chest, or both, to relax the nerve. So, you irritated the nerve deeply. I had no idea what was happening and went on with my hike, being super-mindful about walking slowly, taking short steps and trying to focus weight away from that heel and onto the arch and toe, meanwhile just feeling discomfort in the right heel rather than outright pain. But the next morning when I woke up, I couldn't put any weight on that heel without bad pain. Dr. Blake's comment: Have you a history of sciatic on that side or any low back or spine in general issues? 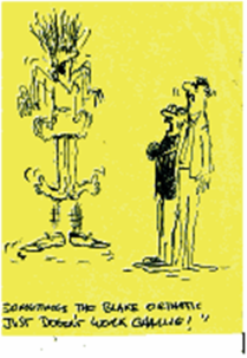 These can be the first low grade irritation, that makes the sciatic nerve grouchy, but the stretch does you in. Nerves love motion, not prolonged stretches. I ALWAYS wear your orthotics with the heavy boots, except when in the shower, and I've been really good about stretching, so this new problem really stumps me. The pain is under the center of the heel, and gets worse as the foot flexes and the back of the leg stretches (e.g. when doing a "wall stretch"). You say on your blog that PF develops slowly, so I initially thought it might be bursitis. But I don't do anything that results in impact on the heel - all I do is walking. And the pain seems to have been triggered simply by a routine stretching movement. Dr. Blake's comment: Yes, see my video on neural flossing, get some Neuro-Eze to massage 3 times a day, avoid low back, hamstring, or achilles stretching until it is better. Lift everything with your knees bent. Soak in warm water to see if it helps. Give me feedback within the next 2 weeks. I've been doing the ice bottle roll combined with mild stretching for a week with no improvement. I understand these things are sometimes tough to diagnose, but in any event I haven't had good results with our local podiatrist and thought I'd run it by you first. Feel free to post to blog if desired. I have been following your blog for years and have a question about neuromas. Mine was under control for 5 years (with custom orthotics, met pad, wide shoes) until I was in a boot for PTT on the other foot and it flared. Since then I've not been able to get ahead of the irritation/inflammation cycle. Twice I've irritated it to a new level, most recently trying acupuncture. Before the acupuncture, I could wear Birkenstocks in the house without symptoms but now even standing for a short time will bring on symptoms and only elevating my foot keeps the symptoms away. Shoes, tight socks, sleeping (I now wear a Birkenstock at night), driving especially, all irritate it. I have had two cortisone shots which didn't help (I was told at least one was not long-acting). Thanks for the email. It sounds like you irritated the nerve, more than caused inflammation (since the shots should have helped an inflammatory problem). It could have been the unevenness to your spine of the boot that caused a sciatic nerve irritation affecting the foot. I would approach it this way for the next month. Neural Flossing three times a day. Experiment on removing the met pad which can irritate an irritated nerve. Avoid the bend at the toes with the boot on the neuroma side with orthotics, or a mountain bike shoe with a flat bottom, or a Hoka One One shoe (they have a couple of versions that are wider in the front). Avoid shots and acupuncture on the sore foot. Acupuncture on the opposite hand or earlobe can be considered. Look into a 2 month trial of Quell. Try a scooter to off weight at home and museums if the other side can take the weight. Since it appears to be nerve pain, consider seeing a pain specialist for oral intervention (at least an evening dose of Lyrica, etc.). Create an environment for May of 3-4 level pain, and find out what you can and can not do. In June, we will try to increase your activity, and lower the pain to 2-3 consistently.